⚓ T61422 NLA Channel context menu > Delete channels operation does not work. 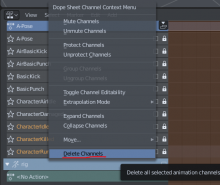 NLA Channel context menu > Delete channels operation does not work. 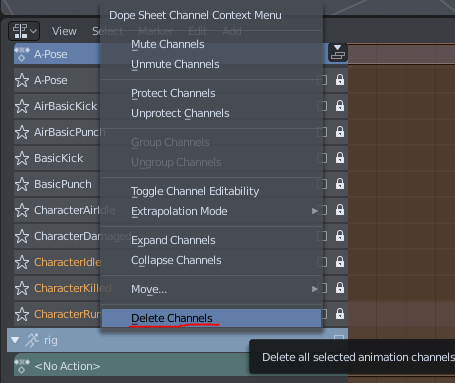 Trying to delete a NLA Channel from the context menu (Right Click) doesn't work. Using delete button on the keyboard does work though. Hmm, is that actually supposed to work like that? The same "problem" seems to exist in Blender 2.79. @Jacques Lucke (JacquesLucke) I presume the Delete Channels command is suppose to delete channels. What else should it do? @William Reynish (billreynish), I don't know, I haven't really used the NLA editor at all... I'm just saying that the operator also does nothing in Blender 2.79 (which I usually as baseline). It's confusing/weird that the Delete option of the menu doesn't work but the rest of options does. At first I though that it was not possible to delete channels until I pressed the Del key. I think the menu option should delete the channels as the Del key. This is the menu for the dopesheet / graph editor that is being show in the NLA editor. It doesn't make sense there. It should be hidden, or replaced by a context menu with operators for editing NLA tracks and strips.